So this post has been sat in my drafts for a while now, as I thought it would be a rather useful post to some, if not many people! However, it has taken me a while to get around to actually writing it! So here I am, with no posts scheduled thinking "I better start writing up some of my drafts before it is too late". A perfect time to speak about deadlines and how to deal with them! I would say I am an organised person and if I'm not organised, I will panic and stress until my hair falls out; this is no exaggeration either! Therefore, being organised and having to deal with deadlines is something which comes naturally to me especially being a university student and a blogger too! I also cannot forget working in a school when you have to get things done by a certain time. The one aspect which brings a lot of anxiety to many people, having a deadline! 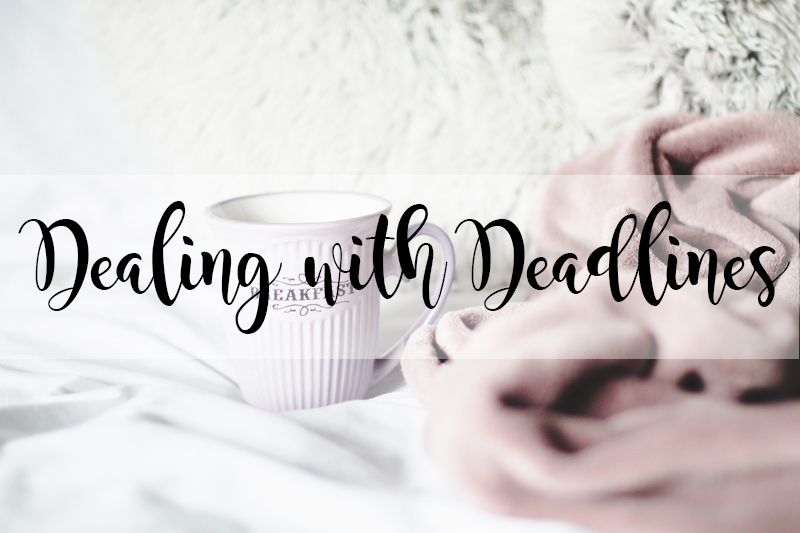 So here are my top tips with dealing with deadlines! First things first, don't leave anything till the last minute! If you know you have a deadline, whether it is a week away or even a few months away; no matter what it is, do not leave it till the last minute. Make sure you leave time to plan ahead and then plan every moment of time you have in between right now, and the day of your deadline. If you know your deadline is in a month and you have a lot of different things coming up within the month, plan around them! Dedicate days to get whatever it is done than needs doing. I found I will always write everything down into my diary, but if I don't look in my diary, I will always forget about something which is about to happen! I have found by giving myself little reminders in my phone calendar, I always know when something is about to happen and this doesn't give me a chance to forget! I have found this definitely helps with transferring money when my car insurance is due! Make sure you leave time for yourself. I cannot express this factor enough! You need to make sure you leave time to relax and to pamper yourself! If you spend every spare moment you have dealing with whatever you have a deadline for, you're going to get stressed, you're going to feel anxious and you're going to feel overwhelmed and then it will end up a complete disaster and you'll feel miserable. At least this is how it usually turns out for me anyway. Make sure to leave an hour of every single day to relax and do something for you! There's no harm in self love! How well do you cope when you know you have a deadline coming up?